Turn right onto the Broken River Skifield road (gravel). This excellent circuit track to Lyndon Saddle and Lyndon / Helicopter Hill begins by the shelter at the Craigieburn picnic area. The track crosses the Cave Stream and grassy terraces, and then sidles steeply through dense regenerating beech forest. The saddle has a four way junction and the track to Lyndon / Helicopter Hill climbs along a steep ridge with open screes between the beech forest. In parts the track is not clearly marked, but the route is obvious. 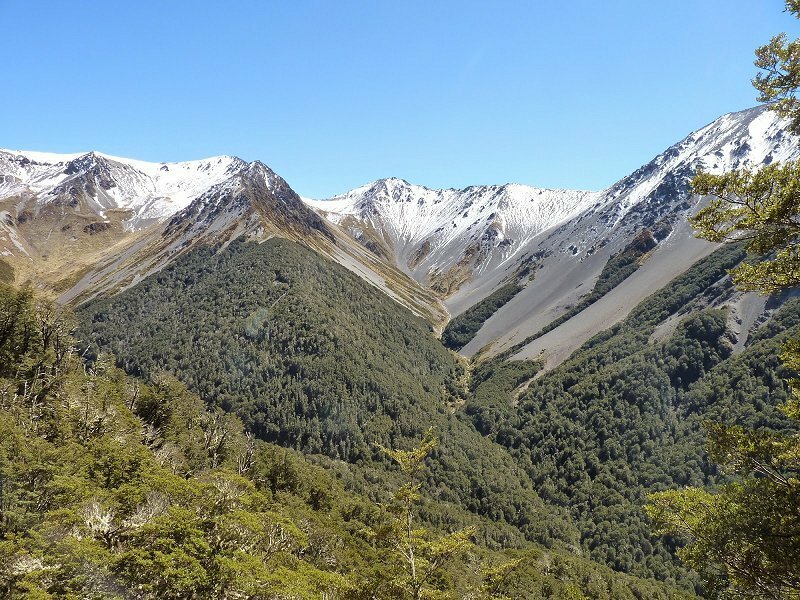 The top of Lyndon / Helicopter Hill (1262m) is covered with tussock and low herbs and grasses with some stands of exotic pine trees on the lower slopes. This is a superb viewpoint for the Craigieburn and Torlesse Ranges and the limestone landscape of the Castle Hill Basin. Back at Lyndon saddle an alternative track leads down through low glacial terraces with some tall attractive beech forest, and reaches the Broken River skifield road. It is about 20 minutes down the road and back to the shelter following the meandering Cave Stream.